If the cat is escaping and you think there may be a collar problem, firstly check the collar fit. If the collar is not tight enough the contacts will not be in touch with the cat’s skin and therefore he or she will not feel any correction; rendering the system useless. Also check to see if something has changed around the boundary, has a large piece of furniture or structure been placed near to the boundary that can give the cat a “leg up” so that they can climb up and over the zone? If so either remove the object or increase the range to make the zone larger as described further below. Ensure you have your tester (star shaped object) and your collar to hand, this enables you to do all the tests necessary with the collar. Firstly make sure the collar is drawing power from the battery, to do this you need to locate the test point on the collar. For the mini (R7m) there will be a small ‘D’ shaped indent on the right hand side of the collar. Now using the tester place the magnet end (silver tip) to the test point on the collar – you should hear a number of beeps. This indicates the level the collar is on (1 beep=level 1; 2 beeps=level2; etc.) through to level 7. The long beep indicates the shock is turned off and the collar is set to audible only. To change the training level on the collar all you need to do is hold the magnet in place, the collar will run through all the levels continuously until the magnet is removed. + end up. 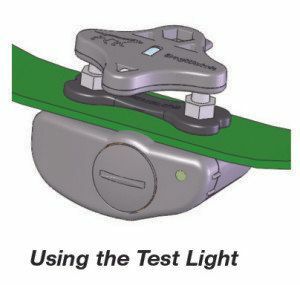 Make sure the battery cap is on securely and re-test the collar with the tester. If it still doesn’t work put a new battery in the collar, which can be ordered from our shop. If the collar is beeping through the levels then move on to testing the shock is working correctly; to do this you need to take the collar and tester to the transmitter box (white control panel that is plugged into the mains). Hold the tester over the contact posts of the collar – there is 2 holes in the tester with a silver wire running through them. With the tester and collar touching, hold them up to the transmitter panel. If the collar is working correctly you should hear the audible warning (beeping) from the collar; the light on the tester should also flash amber, indicating the shock is working correctly. If the collar does not beep or the light on the tester doesn’t activate there could be a fault within the collar – you may be covered under our warranty so give us a call to organise a repair or replacement. If the green light is not on the box should be alarming at you indicating a break in the boundary cable. If both lights are on but the system isn’t working, pull the loop plug out – the green light should go out and the alarming should start (indication the loop has been broken). The red light should stay on. If no alarming this could indicate a lightning strike has broken the transmitter. If the red light isn’t on at all – ensure the system is plugged in and the socket is working. Also make sure the transmitter is switched on. If all working okay, adjust the range located on the right hand side of the panel. Turn the dial ¼ turn clockwise and repeat the collar tests above. If the collar still doesn’t respond after all the transmitter tests have been done; take the transmitter off the wall by nudging it upwards and off the screws. There are 4 tiny dip switches in the back of the box – these should all be in the ‘up’ position. If they aren’t all up, switch them up and restart the transmitter by turning it off and on again – then retest the collars. This tests whether there is a break in the boundary cable or a problem with the cables connecting the surge protector to the transmitter or indeed the transmitter itself. Firstly locate the surge protector which is usually on the outside wall of the building in which the transmitter is located. Open the surge protector by lifting the flap upwards, inside there is three copper screws; Place a screwdriver or coin across the bottom two screws in the surge protection box (this will create a mini loop between your transmitter and the surge protection and eliminate the boundary cable). Leave the bridge across the terminals and take the collar and collar tester and repeat the test at the transmitter panel as previously done. If the collar responds then you have a break/partial break in your boundary and you will need to locate the break. Please note if you have a beeping noise before carrying out this test and the green light is not showing on the transmitter this test will confirm that your cable is broken – when placing the bridge across the surge protector the green light should illuminate and the beeping should stop (a loop has been formed between the transmitter and the surge protector – when you remove the coin the beeping will start again as the loop has been broken). If you have successfully located the break in the boundary cable then you need to re-join the cable using the yellow or grey splice nuts left by the installer. NEVER EVER join the wire using tape, electrical splices – only use the authorised splices (these are filled with silicone) and will give the splice a waterproof seal. Follow the video below to learn how to use the splice nuts. If you have carried out all of the above and your collar/s are still not responding you may have a break or partial break in your boundary cable or a taped joint on the boundary wire. Partial breaks often occur when a previous wire break was fixed with electrical tape, or when the wire corrodes or degrades. Electrical tape works as a quick temporary fix for a wire break, but not long-term – over time it will allow water to corrode the wire, if this occurs the cable will need to be replaced. To fix a wire break always use the connectors supplied by CatFence. These splices will safely and permanently fix wire breaks. A short loop test above will determine whether there is a partial break as the collars will work when the bridge across the terminals is formed, but not otherwise. If you have followed all the above tests and your collar is still not responding please contact us. If you have a break or partial break on your system we can offer a break finding tool for hire or a service call to trace and repair the break – 01628 476475. With proper training and fully functioning equipment, cats rarely, if ever escape. If you continue to have problems after taking these steps, contact us for refresher training for your cat. Use the training flags or some markers to define the edge of signal fields around the property before any landscaping is done. You can locate your fence by using the receiver collar. This will help any workmen to identify the approximate location of the boundary wire. Remember if you have been recently installed and the training flags are still in place that the flags are marking the edge of the signal field and not the location of the cable. Do not throw your training flags away after training. Hold the receiver below your knees with the contact posts up. Walk perpendicular toward the boundary wire. You will first hear the audible tone – This will stop when you are directly over the wire. You will now hear the correction beeps and you can set your flag in the ground. This would also be applicable if you are placing the flags in the ground for the training of a new cat. Test your collar monthly, also check the collar fit & check contact posts and the battery cap on the receiver collar and tighten if needed. It is also a good idea to check the lights on the transmitter occasionally. Remember – the red light shows you have AC power to the system, green light shows there are no breaks in the wire. If you have a wire break, the green light will go out an audible warning will sound. 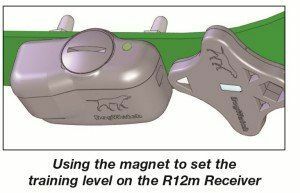 Ensure you change the battery regularly – We offer battery programmes for all CatFence collars. If you join the CatFence battery programme you can have new batteries sent to you automatically, just when you need them! – When your battery runs out guess who else runs out!